Cathay Pacific First Class is one of my favorite airline first class products, so I was looking forward to trying the new Cathay First Class. The hard product is mostly the same, but the first class seats have been done in a more neutral color, and there are some other nice updates. 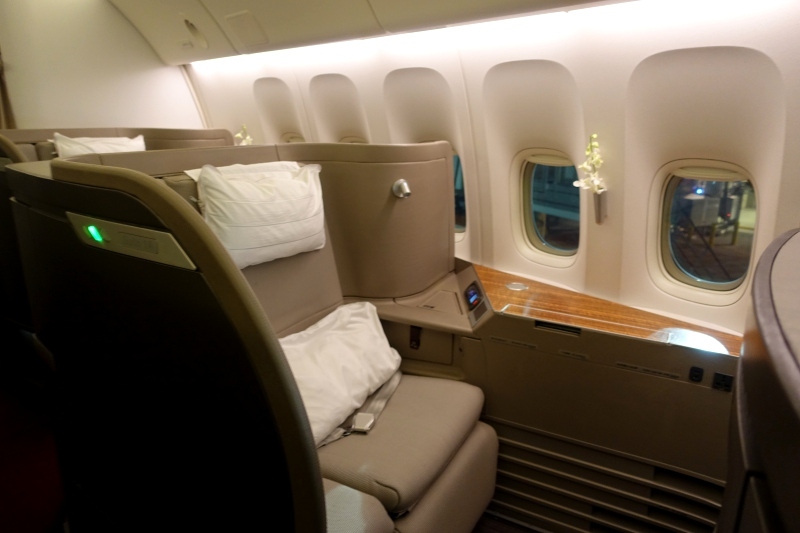 The main exception is Singapore’s new First Class on the 777-300ER, with only 4 open suites, vs. the 8 in the old version. With just 6 first class seats in Cathay Pacific First Class, the cabin is more intimate in feel and typically very quiet. The other thing I love about Cathay Pacific First Class is that there are two lavatories for First Class; that’s one toilet per 3 passengers even if the first class cabin is completely full, which it may not be. You’re much less likely to have to wait for a lavatory, and by the same token, you don’t have to feel as rushed brushing your teeth or washing your face since there is a second lavatory and you’re not tying up the only one. One of the great features of Cathay Pacific First Class is how wide the seats are: 36 inches across, wide enough for an adult and child and read a book together, or even for two slender adults to sit side by side, although of course the more comfortable option is to sit across the table from each other, with one person on the ottoman. The extra seat width comes in handy while sleeping too, especially for those with broad shoulders or who need to move around a bit to get comfortable. 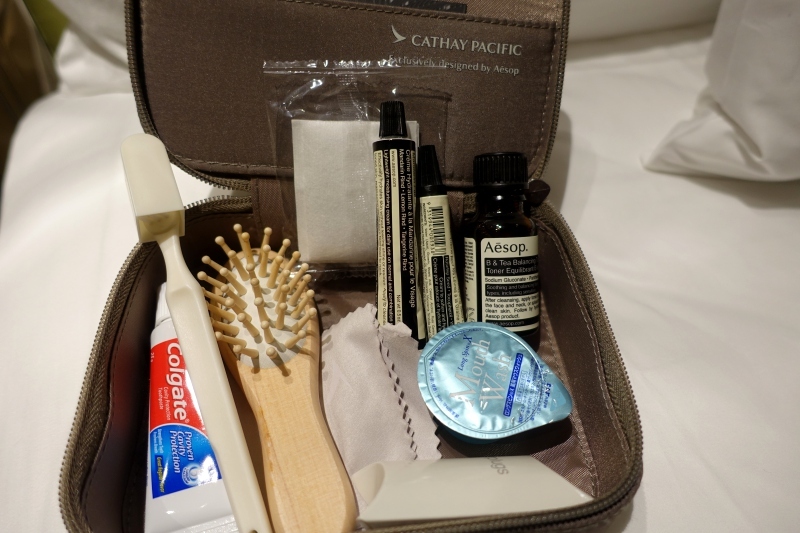 Many airlines offer luxury amenity kits in first class, but Cathay Pacific’s choice of Aesop products is inspired. The products are results based, making use of botanicals in effective compounds, and with an emphasis on moisturizing and anti-oxidants: exactly what you need given the dry conditions of flight cabins. 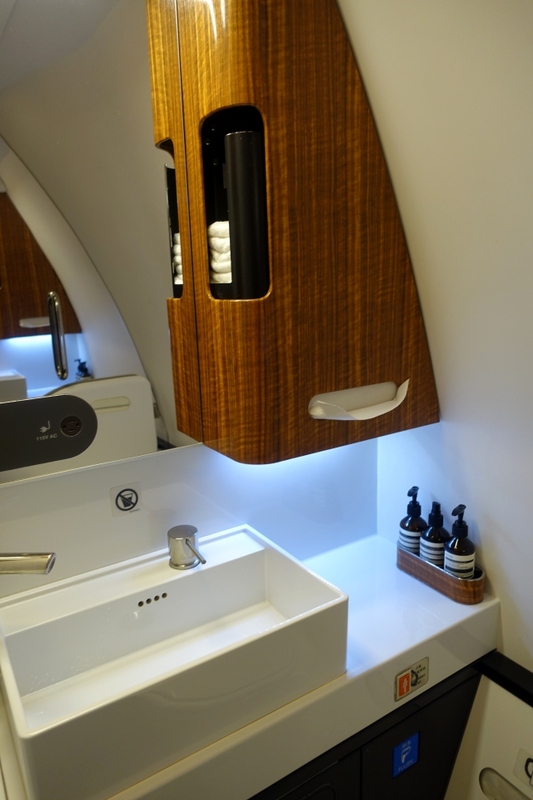 You'll also find Aesops amenities consistently provided in the First Class lavatories and in the Cathay Pacific First Class and Business Class lounges in Hong Kong, The Wing and The Pier. Cathay Pacific’s First Class cabin crew members are helpful, but also kind—when I remembered there was one last thing I needed WiFi to do, one of them even loaned me his hotspot so I could connect. And no sooner would I ask for my bed to be turned down or for it to be changed back into a seat, and the crew was happy to assist. This is certainly helped by having fewer guests to take care of, since there are at most 6 passengers, and no doubt there is some additional training for those working in the first class cabin. Pretty much the only crew that I’d consistently put above Cathay Pacific are Singapore Suites and Singapore First Class. 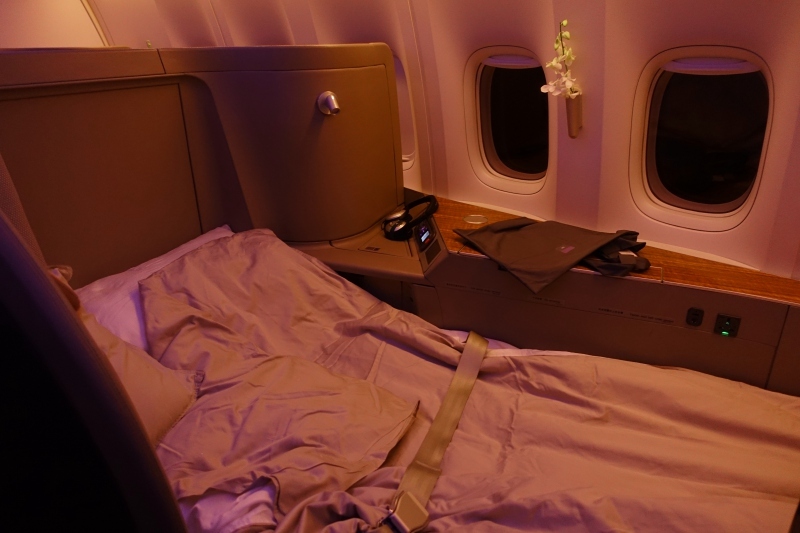 While I’ve certainly had excellent service in other airlines’ first class, it hasn’t been as consistent. 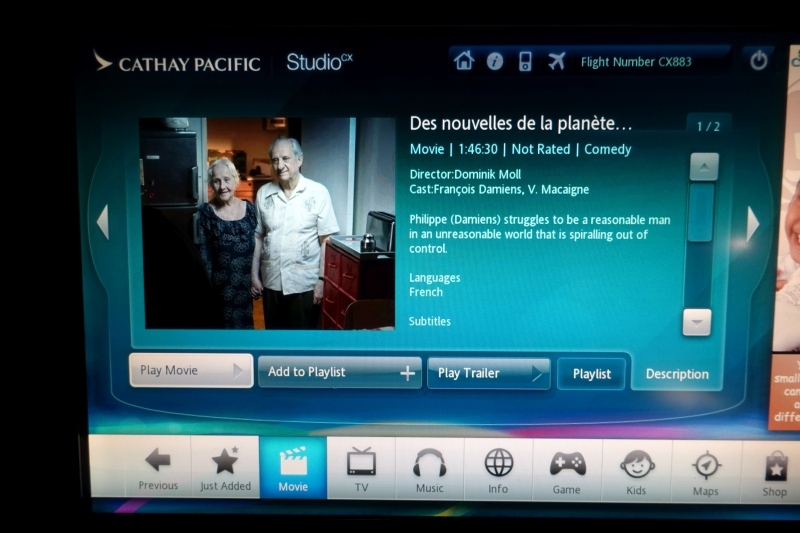 Ok, this isn't specific to Cathay First Class, but Studio CX, Cathay Pacific’s entertainment system, showcases a variety of great movies and TV shows. It’s not quite as extensive as Singapore KrisWorld, but it goes well beyond current box office hits and classics to encompass a variety of Hong Kong and Asian films and TV programs, arthouse films, and well-made TV series such as The Night Manager. To me a good test of the entertainment system is if I find something on it that I enjoy and that I wouldn’t otherwise have known about, and that certainly happened with my recent flight. On a whim, I selected a French comedy, Des Nouvelles de la Planete Mars (News from Planet Mars). Quirky, a bit surreal, and funny. The area that Cathay Pacific could most improve, in my view, is WiFi, since there’s still no Wi-Fi option at all. Naturally I would prefer a fixed rate option, similar to what Etihad offers. Given the length of Cathay Pacific flights between the U.S. and Asia, it’s a very long time to be disconnected. The other aspect of Cathay Pacific First Class that I’d like to see improved is the food. This is not to say it's bad; it's just that I've had much better food in Qantas First Class, JAL First Class, Singapore Book the Cook, and Etihad First Class. 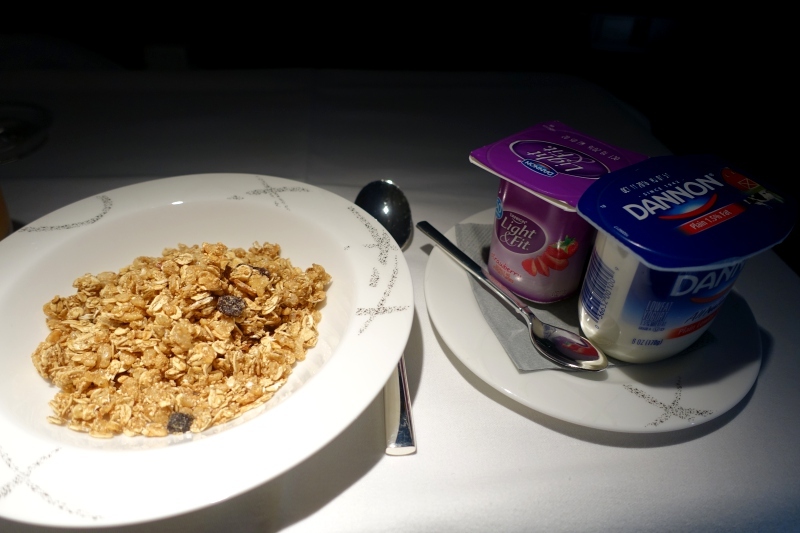 Granted, this time I only had caviar service and breakfast, but even for breakfast I’d like to see freshly squeezed juice (at least orange juice, which Air New Zealand Premium Economy even serves passengers) and better quality yogurt. This time it was Dannon yogurt, instead of the fantastic French la Ferme des Peupliers yogurt I remember from a few years ago, and Dannon yogurt in the U.S. is just not good. Far better yogurt choices for U.S. originating flights would be Noosa yogurt and Wallaby organic yogurt. The granola could also improve. 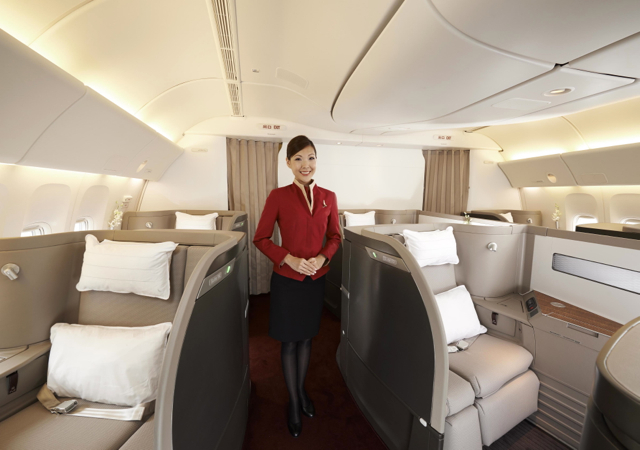 What are your favorite and least favorite aspects of Cathay Pacific First Class?